The Easter Bunny greeting children in 2017. Redington Beach Property Owners sponsored event held in Town Park. 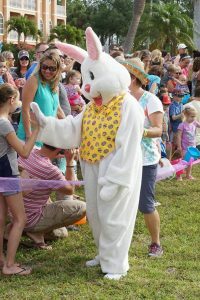 Easter egg hunt for children. Visit from the Easter Bunny with photo opportunities, too! Lots of games and prizes.